The massive protests sweeping Venezuela come at a time when many in that country have an increasingly dark view of both their own standard of living and the direction of the nation’s economy. A record low 33% of Venezuelans said their standard of living was improving, according to a Gallup poll conducted last fall and released Tuesday. 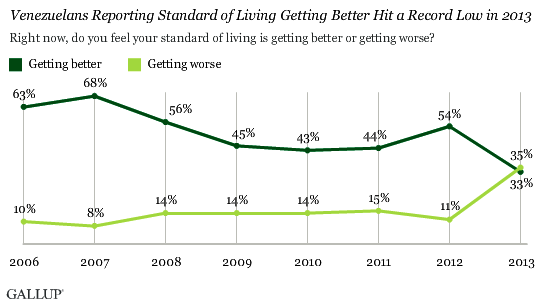 Just a year earlier, 54% had said their standard of living was improving. Pessimism about the economy also runs high. About six-in-ten (62%) Venezuelans said the economy was getting worse, a huge increase compared with the 22% who held that view in 2012. Beyond the economy, fear of crime contributes to Venezuelans’ unhappiness. In the Gallup poll, eight-in-ten said they did not feel safe walking alone at night in the city or area where they lived, while those saying they did feel safe dropped from 34% in 2011 to 19%.